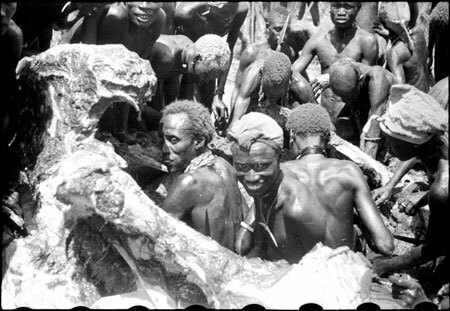 Nuer porters cutting up an elephant shot by Thesiger with their spearheads. Big game hunting formed a significant element of Thesiger's activities in Western Nuerland, and he later acknowledged that it facilitated his acceptance by the Nuer, and provided nutrition for his porters, who called themselves 'Kwechuor's men' after his ox-name. Morton, Chris. "Nuer elephant butchery" Southern Sudan Project (in development). 03 Jan. 2006. Pitt Rivers Museum. <http://southernsudan.prm.ox.ac.uk/details/2004.130.32798.1/>.